This year we had a laid back Thanksgiving. We stayed home Wednesday instead of fighting traffic. 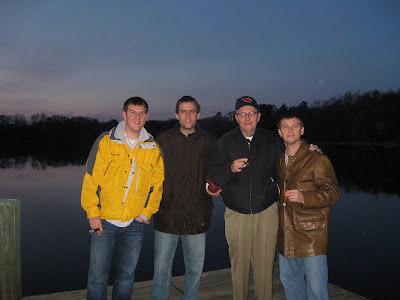 On Thursday we leisurely made our way over to the Eastern Shore for dinner, our annual post meal walk with cigars, and then some quality football watching (E-A-G-L-E-S EAGLES!) Jeff stopped by because it wouldn't be a Schreiber Thanksgiving without him and we went to the outlets at midnight! We are crazy, but not nearly as crazy as the pajama clad shoppers waiting in lines just to get in some of the stores. The trip was a bust and we came home empty handed much to Mark's elation. Friday morning the guys went golfing while I spent some quality time with our cousin Christine. After lunch we hit the road for PA where we had a full weekend of friends and family! It was a blast! We were able to spend time with the friends and family we are thankful for. What could be better?